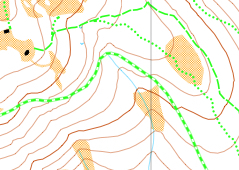 This special winter map shows snowshoe trails in Mount Spokane State Park in the area of Bald Knob picnic area. Park on the road just north of the Sno-Park lot, which is at the intersection of North Summit Road and North Mount Spokane Park Drive. The starting area is at Trailhead 131 on the west side of the road. Don't forget your Discover Pass and Sno-Park Pass (or combo) for parking.